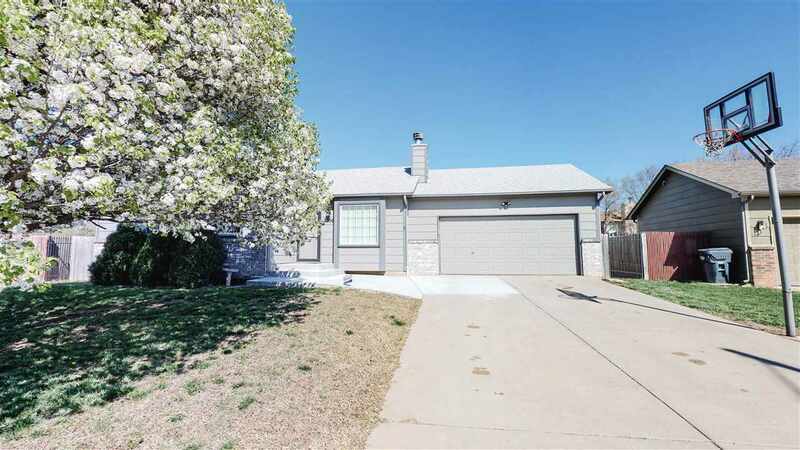 This immaculate 4BR 3BA ranch is move in ready! As you enter the living room, you'll see the beautiful fireplace and recently updated laminate floors. The kitchen counters and back splash have been recently upgraded as well with a durable refinish that looks like real stone. You'll find carpet in two of the main floor bedrooms with ample closet space. The spacious master bedroom has laminate flooring and double closets. The main floor bathroom has the same counter and back splash update as the kitchen and looks fantastic. Downstairs, you'll find the fourth bedroom, which could also make a great office or workout room. The finished basement space is open and flexible for many uses and with its wet bar, makes a great entertaining space. Outside, you'll find your newly finished back deck, wooden fence, and freshly poured front steps that add to the life and curb appeal of this wonderful home. Goddard schools and no specials! Schedule your private showing today! All info deemed reliable but not guaranteed.